Here's where to watch every episode of Dharma & Greg season 4. Mouseover or tap an episode to see where to stream it. Click or tap the play icon to stream it on the best available service. Mother and Daughter Reunion Oct 10, 2000 In the fourth-season opener, Abby's plans for the new baby rattle Dharma, because Abby's admission that she and Larry made mistakes raising Dharma â€“ like letting Timothy Leary babysit â€“ threatens Dharma's memories of her childhood as idyllic. When Abby's pregnancy is threatened by complications, Dharma feels obscurely responsible, until a visit from the spirit of her dead friend George sets her straight. Meanwhile, Greg's advice helps Pete and Jane make a move to repair their crumbling marriage: they announce they are getting divorced. Love, Honor & Olé! Oct 24, 2000 Dharma tries to reconnect with her old life by planning a wild road trip to Mexico with her friends. When Greg decides to go along for the ride, Dharma's friends are less than pleased. Meanwhile, Larry lands a job as a night security guard with Edward's company in order to get medical insurance for the baby. Playing the Field Oct 31, 2000 Greg fouls out as part of his wife's New Age softball team, while Dharma learns that Edward's sporting a new lady around town. Hell No, Greg Can't Go Nov 14, 2000 A small war breaks out as Dharma stages a protest to halt Greg's plans to enlist in the Army. But once he does, the legal eagle's stuffy style has the troops ready to boot him out of boot camp. Midwife Crisis Nov 21, 2000 Abby's labor is a real pain for Dharma when she must share midwife duty with a celebrated author well-versed in childbirth. Meanwhile, Larry's also acting like a brat, after Kitty and Edward present the expectant parents with a new van. Sleepless in San Francisco Nov 28, 2000 Abby turns a blind eye when Dharma goes the extra mile to help care for the new baby in the Finklestein family. 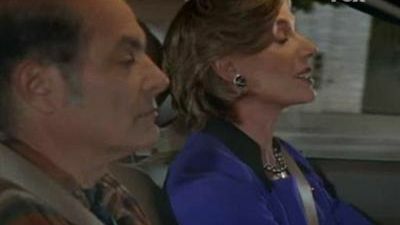 Mad Secretaries and Englishmen Dec 5, 2000 Dharma & Greg's love life suffers because neither of them can keep from helping other people with their love problems, including Greg's crazy, lovesick secretary Marlene. Their romantic getaway gets postpones so Dharma can set Marlene up with Jane's flaxy ex. Meanwhile, Abby comes up with a scheme to make money and feed Harry at the same time. Charma Loves Greb Dec 12, 2000 Dharma realizes she should have left well enough alone when Greg's surprise party nearly brings the Finklesteins and Montgomerys to blows. Boxing Dharma Dec 19, 2000 Dharma regretfully taps into her hidden anger and a penchant for boxing when a woman challenges her to a barroom brawl. Meanwhile, Larry takes his familial relationship with the boss for granted. Dutch Treat Jan 9, 2001 When Dharma and Greg disagree about playing role model to their young college friend Donald, they decide to experiment with independence for the first time since their marriage began. When things finally get really tense, only an obscure dream and a visit from Abraham Lincoln can close the divide. The Box Jan 16, 2001 Dharma begins to come unglued when she can't figure out what Greg has locked away in his box of mementos; and Larry makes a big deal out of finding a little something for Abby. Let's Get Fiscal Jan 30, 2001 Dharma regretfully seeks Edward's business advice when the co-op's slush fund comes up empty, and Greg works with a very successful attorney whom Dharma used to date. Dharma Does Dallas Feb 20, 2001 Dharma gets to know Greg's dysfunctional cousins and in-laws just in time to keep Edward from making a huge mistake in choosing his successor as head of the firm. Judy & Greg Mar 13, 2001 Fleeing from Kitty's talk on popular restoration of Victoria architecture, Dharma drags Greg into a neighboring high-school reunion for the class of '81, assuming the identities of no-shows Todd and Judy. She is non-plussed to discover that everyone present loathes ""Judy"" for the terrible things she did to them in high school, and decides the universe wants her to make amends by visiting each of Judy's former victims and apologizing. 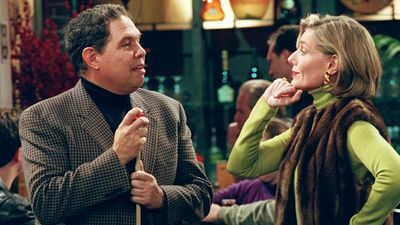 When this doesn't work out, she tracks down the actual Judy for a confrontation.Meanwhile, Larry offers Edward tips on how to revitalize the sexual side of his marriage, and encourages Abby to do the same for Kitty -- but their advice (""let the other make the first move"") leads to stalemate. Do the Hustle Mar 27, 2001 Dharma finds a way to bond with Kitty â€“ and score some cash â€“ after unleashing her mother-in-law's secret skills as a pool player. Greg, meanwhile, races around town to find a replacement rat after killing his wife's beloved house pest. 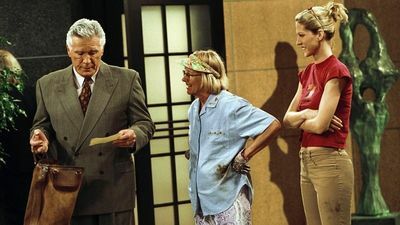 For Pete's Sake Apr 3, 2001 In an effort to boost Pete's confidence, Dharma makes the naÃ¯ve mistake of convincing Greg to leave the practice in Pete's very incapable hands. Kitty Dearest Apr 10, 2001 Greg loses his cool with Kitty after another one of her annoying charity events, creating a cold front between the stubborn mother and son. While Dharma tries to bring back the love, Kitty goes out and gets herself a better little boy. The Story of K Apr 24, 2001 Kitty's swing at writing erotica leaves Edward exhausted, while her editor (Dharma) finds that the work suffers when the couple plays too much. Meanwhile, Greg avoids the issue entirely by submersing himself into building a model ship. Pride and Prejudice May 1, 2001 Dharma's paranoia reaches a new height when she discovers her own prejudice against little people. How This Happened May 8, 2001 A simple garden on Montgomery-owned land triggers a war of the roses (and ladybugs) between Kitty and Dharma's hippie friends. Meanwhile, Dharma gets her hands dirty helping one of Ed's wrongfully terminated employees put his life back together, whether he likes it or not. The End of the Innocence (1) May 15, 2001 Dharma drags Greg to a kooky couples counselor after he finds a lost love letter from her old college tutor. But when she refuses to avoid her other man, Greg takes a stand that could cause a parting of ways for the mismatched pair. The End of the Innocence (2) May 22, 2001 After catching Dharma innocently hanging out with her old college tutor---and failed suitor---Charlie, an enraged Greg moves out. Then the misunderstanding turns into a crisis as they both get caught up in the planning of their mutual friends' impending wedding, compelling Greg to seriously reevaluate his own crazy marriage. But when he finally sees the light, it may be too late.